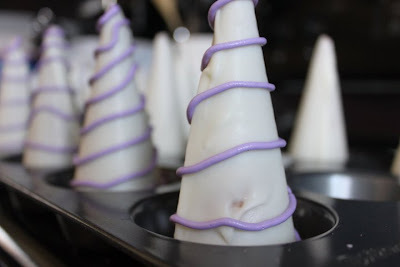 Like my previous post, I obviously love a good theme party, and when it's for my own munchkin I usually go all out! I get a lot of inspiration from the internet and one of my favorite blogs is Hostess with the Mostess. 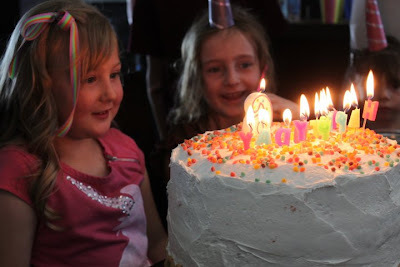 I saw a Rainbows and Unicorns party featured on her site a few months ago and knew I needed to subtly suggest this theme to my little tomboy daughter, Brookie. She wants big red trucks, has aspirations to be like her daddy and play goalie in hockey and last year asked for an Iron Man mask, so I thought it might be a miss. I was wrong. Apparently, the pictures sold her on the idea and she was all for it! Hallelujah! 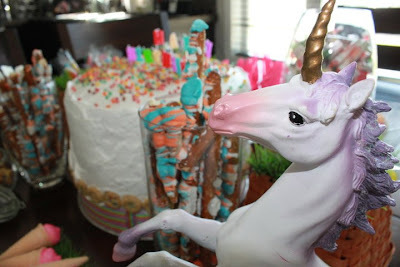 I must say, a rainbows and unicorns theme is so simple and I love the old fashioned birthday party feel to it. No trademarked cartoons and no birthday kit in a box here, just a lot of pink, blue and purple! The invitations I ordered through PrintYourHeartOut on etsy, if you follow this blog, you know I am a fan. The seller charges a small price, they design you a custom invitation in less than an hour and send you the file. You take the file to a print company and voila! Beautiful invitations! Now, you will see we did not know how to make donations for the Save a Unicorn foundation as they never returned our calls, but a group close to our hearts in this family is the Alberta Animal Rescue Crew Society and Brookie asked for donations in lieu of gifts for them. 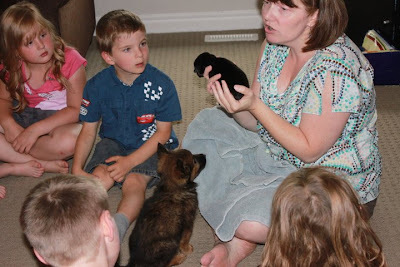 In turn, Loretta from AARCS came in, brought some puppies and taught the importance of "Adopt, Don't Shop!". The kids loved it and everyone felt good about it at the end of the day. Pretty proud of my little peanut for that. The cake. Oh the cake. Now, I only have one round pan, so that was actually the main challenge here, as this cake had to be started two days ahead of time. 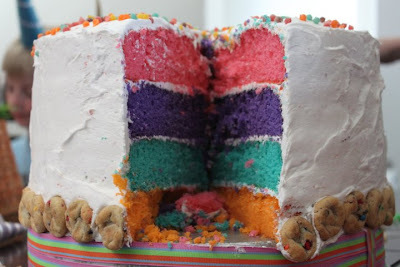 People inquired how I got the colours so vivid, I used Wilton Gel colouring and used enough of it, but not so much it changed any flavor to the cake. 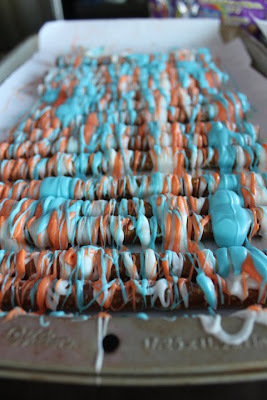 I also made candy coated pretzels by just drizzling them with candy melts in pretty colours. No one ate them, maybe they looked TOO pretty. 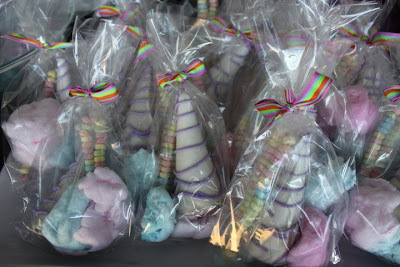 I also made unicorn horns from sugar cones and candy melts and made treat bags with cotton candy and candy necklaces. These kids' dentists have me on their hit list. 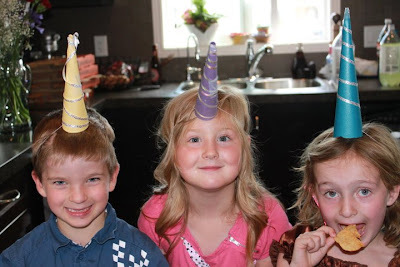 For party hats, the kids wore horns, and maybe I should have announced that humancorns should not charge at one another while wearing such fancy hats. No good comes of it. 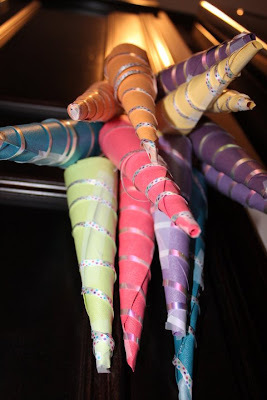 These were made with a few choice words the night before - who KNEW that making a horn would be so difficult?! 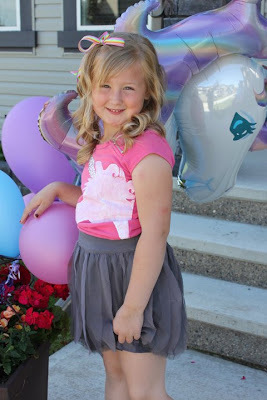 I made Brookie a custom shirt after shopping in every store possible for a unicorn shirt by painting a pick shirt with fabric glue and using fabric adhesive to attach little rhinestones. On HWTM they said the theme of the party revolved around these gorgeous helium inflated balloons and when I see something I must have I do not give up. 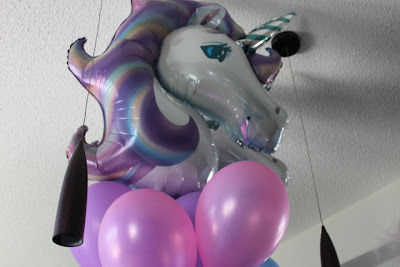 Apparently though, Canada Post felt like giving up for a few weeks to go on strike right before her birthday and messed up my plans of ordering these online, so I sent out a "HELP - SEEKING UNICORN BALLOONS" plea on my Buy & Sell at work and voila! Sure, I had to drive across town, place BALLOONS on hold, spend $20 on two balloons and another $15 on helium, but they are so pretty! The candy buffet this year needed to be cut in about 1/3 from last year after it saw me buying every red and purple candy in the city. There was plenty enough to get a group of 6 and 7 year olds wired though, don't you worry! For the lollipop displays, we turned some woven baskets over and placed some faux grass over top, both purchased from the miracle store, Dollarama and these worked great as the lollipops stuck nicely into the little holes in the basket. All in all, Brookie said she had a wonderful birthday. That's good, because next year we're going camping!